Damn dude, I remember your old kit. Very nice kit there. How do you like the Vinnie Paul sig snare? possumofdestruction wrote: Damn dude, I remember your old kit. Very nice kit there. How do you like the Vinnie Paul sig snare? Ahh the Forums... I was glad to be rid of them, these are soooo much nicer. I plan to get another crash and china, then possibly another ride and splash. And the Vinnie Paul has some SERIOUS meat behind it. I'm going to use it mostly for anything I do that isn't so blasting oriented. The Tama snare I'm using now has a really quick attack, and it's loud, and it's really good for some good ol' fashioned blast beating the way I have it tuned. Cool stuff. I've always been interested in that snare because of how huge it is. It's actually a really diverse snare. I haven't played anything it hasn't sounded good with. I really like your cymbals set. Great stuff! Thanks DML! The only one there I would consider getting rid of is the ride. But I actually plan on getting a few more cymbals, after I get some new pickups for my guitar and get a new bass. audiotech wrote: Wouldn't have been easier just to keep the 14 and 16 in line with one another? That way you can adjust your hats anywhere you like. 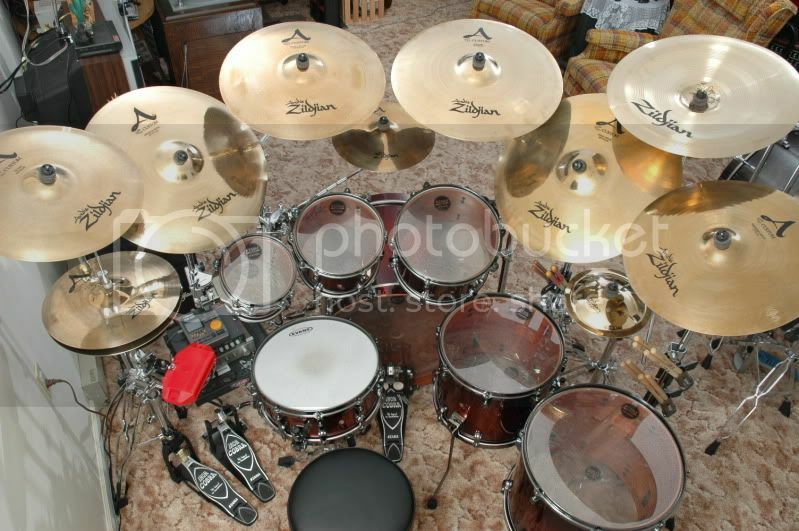 It all depends on how you like to play them, but I have my kits in that order and everything is in comfortable reach. I think he's referring to the stock heads. 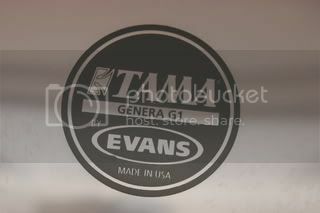 My Tama stock heads were really nice. Granted, I changed them out almost immediately, but only because of preference, not because they were bad. 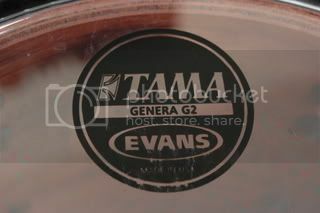 The heads shown here on my Tama Starclassic Bubinga kit are stock heads, but they are Evans G2 clear batter over Evans G1 clear resonant heads made in the USA with the Tama logo. The pictures are of my kit when it was new, about two and a half years ago, but after more than a dozen head changes throughout the years, I haven't found a better head combination yet. All stock heads are not alike as many people realise. Exactly. The only reason I switched is because I play with coated heads now. I'm playing on coated heads on my DW, Yamaha Maple Custom Absolute and Pearl kits, but for my other kits I'm still using Evans G2 clear over G1 clear heads. 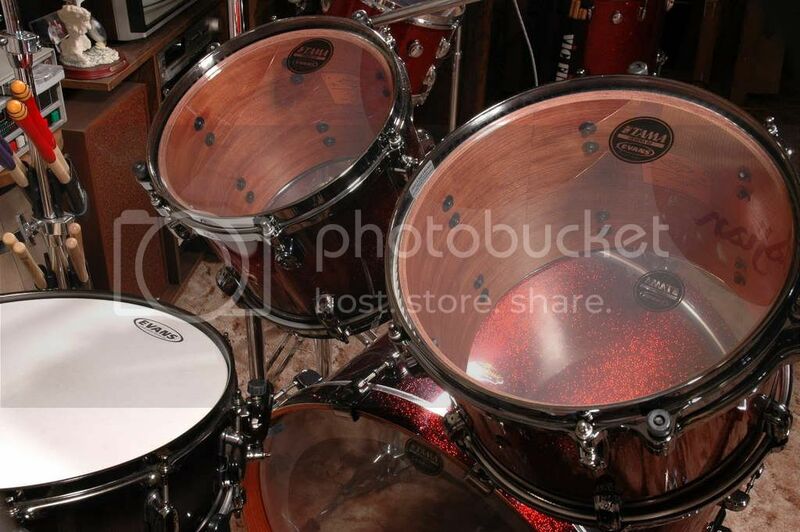 Actually I'm also using single ply coated heads on my toms as resos for my DW Classics. After I find a combination I really like, I usually stick with it for a while. Same here. Coated G2's over clear G1's. I might switch em out for clears next time around, but for now, coated's are just fine for me.